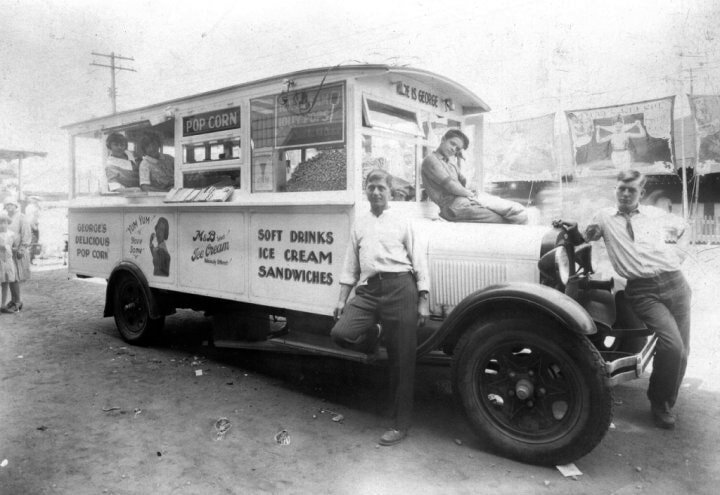 Grandpa George Koinis, an immigrant from Greece, started his candy business shortly after stepping off the boat! As a candy maker he applied his arts to many areas. 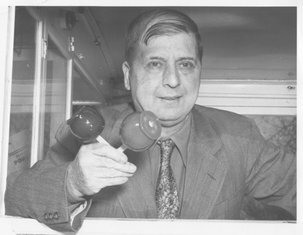 Caramel corns, fudges, and candy apples were his specialties. 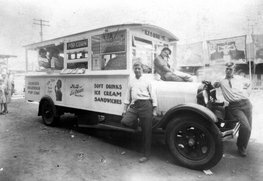 The Koinis family began selling popcorn, hot peanuts-and cigarettes-from wagons shortly after they arrived in America, and members of the family have been doing it ever since (except for the cigarettes). 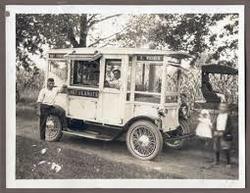 Tracie was drawn to the fascinating vending wagons when she was a child of three or four. The family across the street owned them, and when she saw the wagons coming in after a festival or carnival, she asked her mother if she could cross the street and get a closer look. Her mother always told her no. She was allowed to play with the boy who lived there, though. They would catch bees together. Eventually Tracie’s family moved away. Years later, when both were working a summer job at a harness racing downs, she began to date the guy who worked the wagon and whose family owned the concessions there. She didn't make the connection until he took her to his house-across the street from her old home. Now Tracie is working the family trade, selling caramel popcorn and apples made in the shop at 53 E. Bridge using the original Koinis recipe. It’s not even written down. The neighbor she ended up marrying is local businessman Ron Riebschleger, and he holds the family recipe. Much of the equipment in the store is also handed down and dates to the 40s and 50s. For those who love old-fashioned, authentic treats, this store is tops. 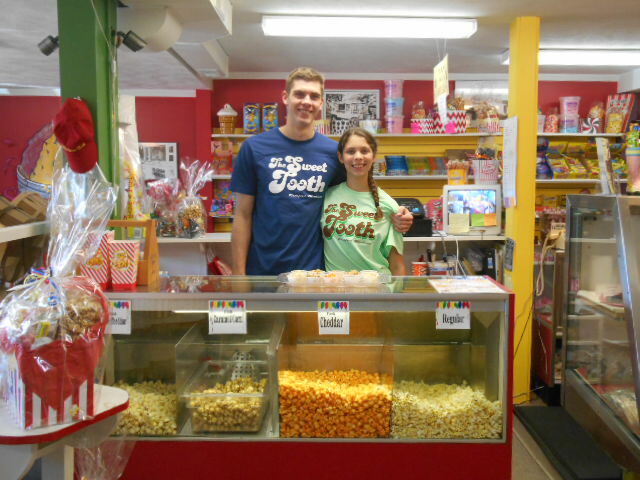 The Sweet Tooth now offers a wide variety of gourmet popcorn. Caramel corn and Chicago-style, cheese popcorn are made completely by scratch. As time allows we are constantly coming up with some less traditional mixes of flavored corns, but our chief corn maker likes the traditional best--and he says "why mess with the best"!?! "Grandpa's recipe" is our traditional caramel corn using the original recipe from 1906. Game day favorites and seasonal popcorn are also available. 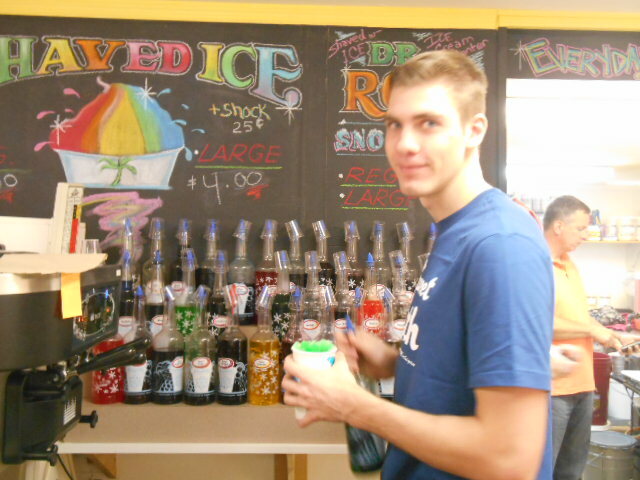 We also have shaved ice. With 26 varieties and two in sugar free, there are plenty of flavors to choose from. 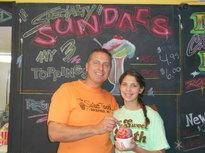 Our most popular snow-cone is the "snow cap" which is your choice flavor(s) with a soft ice cream center. It resembles a creamsicle and will surely melt in your mouth. In addition to Ron’s recipes and hard work, the Riebschleger children Zak, Brett and Delanie can be found putting in hours at the shop. 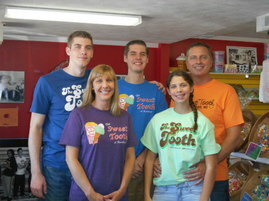 In addition to the family crew, The Sweet Tooth also hired a dozen youngsters for summer work. We also offer retro candies from ages past. Remember Fizzies? You put the tablets in a glass or bottle of water and have carbonated, flavored water. Like gag candy? Yep, we sell all those at The Sweet Tooth, too. Other “retro” candies are available as well as gift baskets. 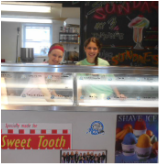 *Assorted retro candies will be based on availability and chosen by The Sweet Tooth staff. Freshness guaranteed. If you are not satisfied with your product, please call or e mail us.